Born and raised in Houston, Texas, I am a first generation American. 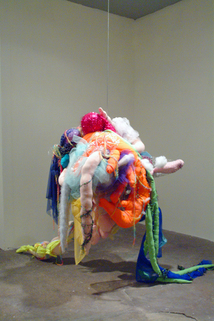 I earned a BFA from the University of Houston in 2006 and completed my MFA in Studio Art Sculpture from the University of Texas at San Antonio, in 2009. In 2013, I accepted a position as Assistant Professor at BMCC in New York City. The works are inspired by natural forms. I see them as microscopic biological entities enlarged to human scale. In this process, I observed concepts in repetition, symmetry and movement. With fabric as a medium, I produced a mixture of very loose, organic shapes and selectively added tensioning apparatuses, inviting the viewer to examine their function and our associations with nature and biology. At times the thread or cables serve a function in the piece, at other times they are used as a way to challenge the material. Suspension, the tear strength of fibers, their elasticity, and the manipulation of fibers within my work cultivated an interesting dialogue. 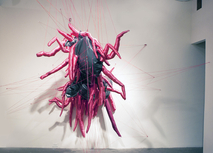 The Pink Cow, suspended with nylon thread, conveyed ideas of entrapment, as if caught in a spider’s web. I was able to find a modularity in many of the organic shapes that I used, and just like in a biome, they multiplied in number and found new ways to interact with different site-specific installations. I imagined them growing and overtaking the environments, perhaps as a virus consuming its host. The installation at the Fox Motel in San Antonio was especially meant to convey a sense that the space has been overcome by a sudden proliferation of shapes.